A covenantal society is one in which words are holy, sacrosanct. This week’s parsha opens with an account of the laws of vows and oaths. What is it doing here near the end of the book of Numbers, as the Israelites approach the destination of their journey to the promised land? Vows and oaths are obligations created by words. They are commitments to do something or refrain from doing something. A vow, neder, affects the status of an object. I may vow not to eat something. That something is now, for me, forbidden food. An oath, shevuah, affects the person not the object. What is now forbidden is not the food but the act of eating it. Both acts bind: that is the primary meaning of the word issar. Such is the sanctity of such undertakings that there are demanding rules that have to be met if they are to be annulled. You cannot do it yourself: the parsha sets out some of the ground rules, the rest of which were supplied by the oral tradition. So seriously does Judaism treat verbal undertakings that one act of annulment, Kol Nidrei, takes place at the start of the holiest day of the year, Yom Kippur. The superficial reason for the law of vows appearing here is that the previous section of the Torah dealt with communal sacrifices. Individuals also brought sacrifices, sometimes because they were bound to do so but at other times because they voluntary chose to do so. Hence the laws of voluntary undertakings. But there is a deeper reason. The Israelites were nearing the land. They were about to construct a society unlike any other. It was to be a free society based on a covenant between the people and G-d. The rule of law was to be secured not by the use of force but by people honouring their moral commitments, their voluntary undertaking to G-d that what He commanded, they would do. A covenantal society is one in which words are holy, sacrosanct. This is the principle at the heart of Judaism as a code of collective freedom, a constitution of liberty. This needs explanation. Any society needs laws. Without that, it descends into anarchy. There are three reasons why people obey laws. The first is that they will be punished if they don’t. This is a society based on power. The second is that it is to their advantage to do so. This is a society based on self-interest. Both have shortcomings. Power corrupts. So, at times, does the pursuit of self-interest. When power is corrupted, there is a loss of freedom. When self-interest prevails, there is a loss of social cohesion. When people care about themselves but not others, the successful thrive while others suffer. Justice and compassion give way to greed and exploitation. The Torah sets forth a third way, in which people obey the law because they have voluntarily undertaken to do so. This is a society based not on power or the pursuit of self-interest but on freely embraced moral obligation. The Torah is the story of how the Israelites came to this unique and radical idea: the politics of covenant. To breed an animal with the prerogative to promise – is that not precisely the paradoxical task which nature has set herself with regard to humankind? is it not the real problem of humankind? Homo sapiens is distinguished from other animals by its use of language. That is well known. What Nietzsche saw, however, is that we use language in many different ways. We use it to describe, communicate, categorise and explain. Language in this sense is a kind of picture of reality, a translation of what is into a set of signs, symbols and images. But we can also use language in a quite different way – not to describe what is, but to commit ourselves to some form of behaviour in the future. So for instance when a groom says to his bride under the chuppah, “Behold you are betrothed to me . . .” he is not describing a marriage. He is getting married. He is undertaking a set of obligations to the woman he has chosen as his wife. Philosophers nowadays call this a performative utterance. In order to have that degree of control over the future, man must first learn to distinguish between what happens by accident and what by design . . . and before he can do this, man himself will really have to become reliable, regular, necessary, even in his own self-image, so that he, as someone making a promise is, is answerable for his own future! When we bind ourselves by words we are using language not to describe but to create – to create an orderly future out of the chaos of human instincts and desires. What makes humans unique is not just the use of language. Other animals use forms of language. Dolphins do. So do primates. Even bees do complex dances that convey information to other bees. What is unique to humans is that we use language to bind our own future behaviour so that we can form with other human beings bonds of mutuality and trust. One such bond is the promise. Another is marriage. 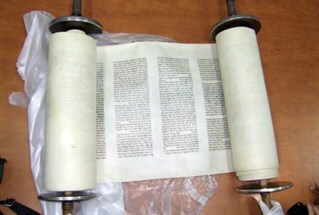 A third – unique to Judaism – is society understood as a covenant, a set of mutually binding promises between the Jewish people and G-d. It is this use of language, not to describe something already in existence but to create something that didn't exist before, that links us to G-d. G-d used words to bring the natural universe into being: “And G-d said . . . and there was.” We use words to bring a social universe into being. What the Torah is telling us is that words create because words are holy: that is to say, they bind. When words bind, they generate trust. Trust is to society what predictability is to nature: the basis of order as opposed to chaos. Social institutions in a free society depend on trust, and trust means that we keep our word. We do what we say we are going to do. If we make a vow, an oath, a promise, a verbal undertaking, then we hold ourselves bound by it. This means that we will actually fulfil our commitment unless we can establish that, due to circumstances unforeseeable at the time, we are simply unable to do so. If trust breaks down, social relationships break down, and then society depends on law enforcement agencies or some other use of force. When force is widely used, society is no longer free. The only way free human beings can form collaborative and cooperative relationships without recourse to force is by the use of verbal undertakings honoured by those who make them. Freedom needs trust; trust needs people to keep their word; and keeping your word means treating words as holy, vows and oaths as sacrosanct. Only under very special and precisely formulated circumstances can you be released from your undertakings. That is why, as the Israelites approached the holy land where they were to create a free society, they had to be reminded of the sacred character of vows and oaths. The temptation to break your word when it is to your advantage to do so can sometimes be overwhelming. That is why belief in G-d – a G-d who oversees all we think, say and do, and who holds us accountable to our commitments – is so fundamental. Although it sounds strange to is now, the father of toleration and liberalism, John Locke (England, 17th century) held that citizenship should not be extended to atheists because, not believing in G-d, they could not be trusted to honour their word. So the appearance of laws about vows and oaths at the end of the book of Bemidbar, as the Israelites are approaching the holy land, is no accident, and the moral is still relevant today. A free society depends on trust. Trust depends on keeping your word. That is how humans imitate G-d by using language to create. Words create moral obligations, and moral obligations, undertaken responsibly and honoured faithfully, create the possibility of a free society.